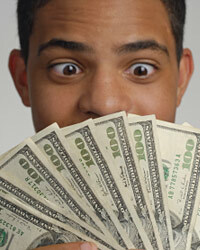 Financing a used car involves a different decision making process than financing a new car. If you approach the two in the same way, you may find you are stuck with a car loan that doesn't work well for your unique situation. Consider the estimated value of the used car, the length of the loan and the ultimate value of the car at the end of the loan to determine if your loan is right for a used car buyer. Your lender will likely perform a separate estimate of the value of your car than your dealer or seller performs. This means the two parties can come up with two different numbers for the price. You may guess that a seller's price is typically higher than a lender's price, leaving you short a few hundred or a few thousand dollars. While you can always attempt to get a lower price from the seller, you should also seek the highest valuation possible from the lender. The two main sources to find car prices are the Kelly Blue Book and the National Auto Dealer's Association. Independently research the prices listed by these two organizations before you speak with your lender. This will provide you with the knowledge you need to determine if your lender's estimate is too high or too low. A loan on a used car should be kept to 48 months or less. Even 48 months may be too long for some borrowers. The main reason for this shorter loan option is the rapidly decreasing value of the vehicle. As soon as a car leaves the lot, its value decreases sharply. Each year or each mile it is driven, the car again loses value. At the end of your loan, you will ultimately own an asset that is worth much less than you paid for it. However, you can minimize this loss by seeking a shorter loan. Owning your asset outright in three or four years will offer you more chance to profit from your investment than waiting 6 years to do so with a 72 month auto loan. These long loans should be avoided because you will end up losing far too much money on the financing at the end of the loan. If you default on your loan, the lender will seize the asset to recover losses. What will happen if your car is worth far less than the amount remaining on your loan? If you are in a recourse loan, you will be responsible for paying the difference. This is a very high risk with a used car since its value will drop so sharply during the life of the loan. Protect yourself from the threat of further damages in the case of a default. Seek to locate a non-recourse loan. In this case, you would be relieved of the requirement to pay the difference if you default on a loan and do not have an asset valuable enough to cover the loss to the lender.